In the first years of the twentieth century, companies like Harley-Davidson and Indian began producing motorcycles for the general public. 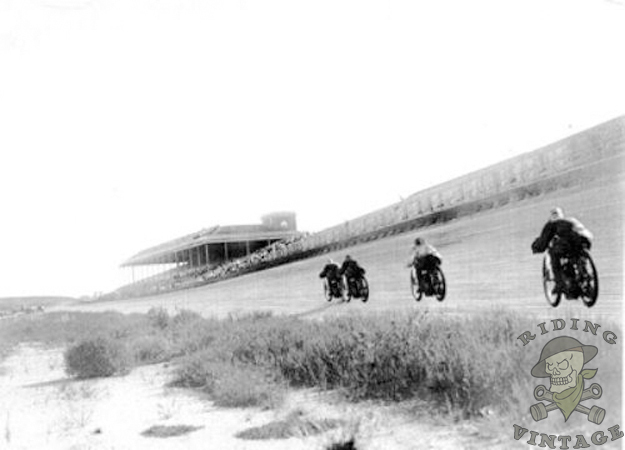 Although there is not an exact date of the first motorcycle race, you can be sure that as soon as there were two motorcycles on the road, there was racing. 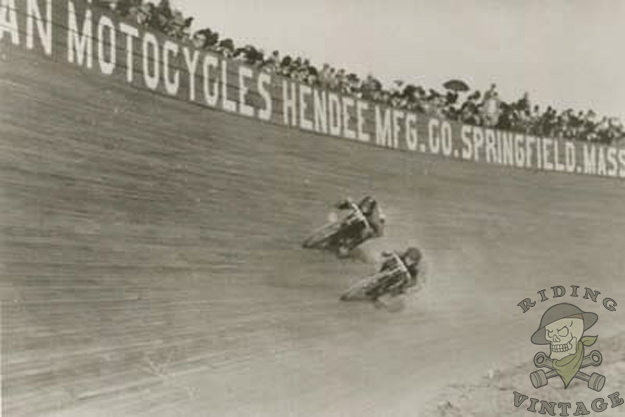 As more and more motorcycle manufactures started popping up across the US, motorcycle racing started making it's way to more official venues. 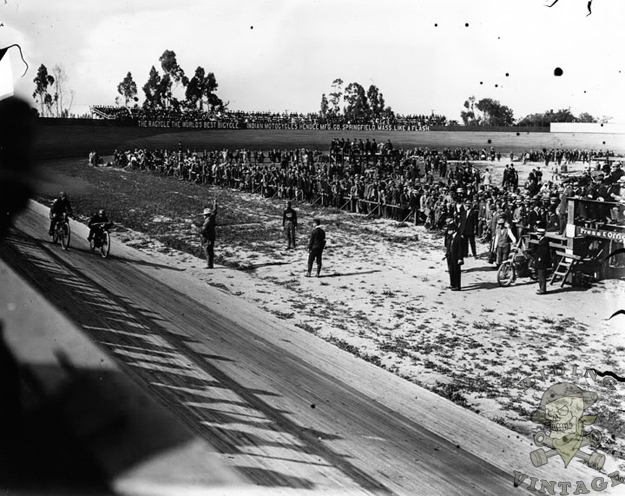 The earliest races were held on dirt tracks used for horse racing or on bicycle velodromes. 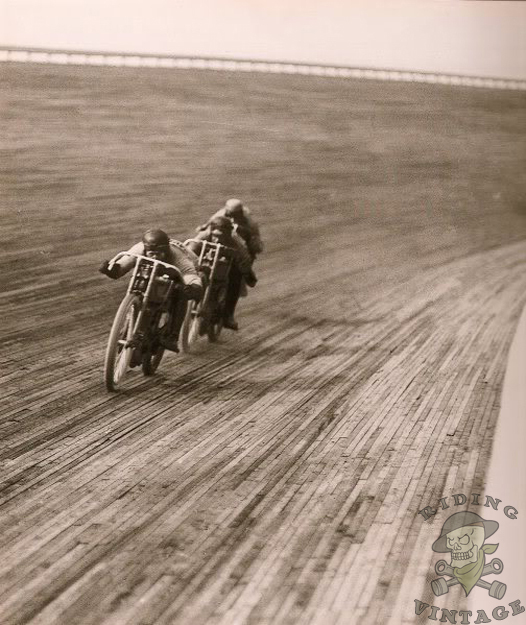 These were sufficient for the motorcycles of the early 1900's, but as the sport increased in popularity and the speed of the motorcycles closed in on 100 mph, the need for a purpose built track became apparent. 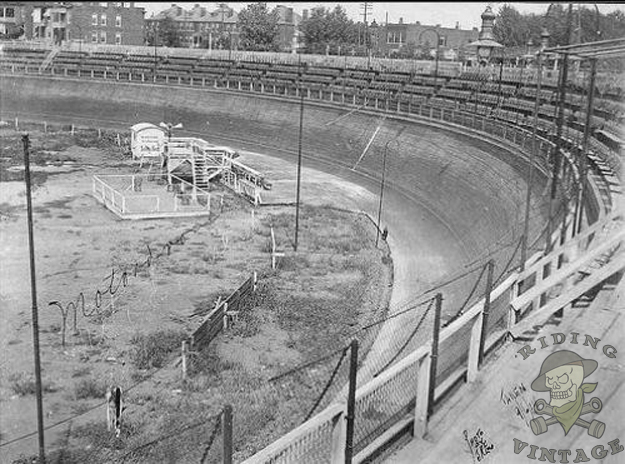 The board track or motordrome was designed provide this much needed racing venue and was used by both motorcycles and automobiles. The first board tracks waere constructed in Los Angeles, California sometime in 1909. 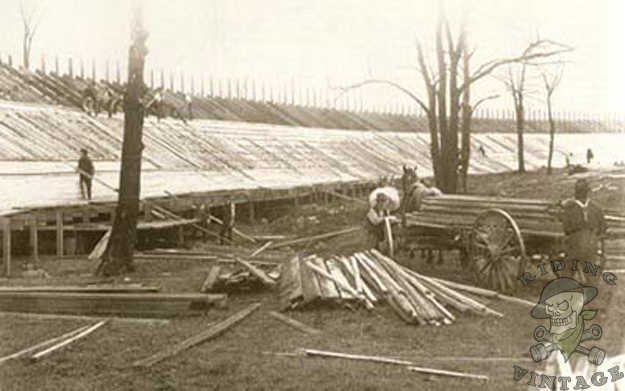 At the time, lumber was inexpensive, so constructing an entire track out of wood was not as cost prohibitive as it would be today. 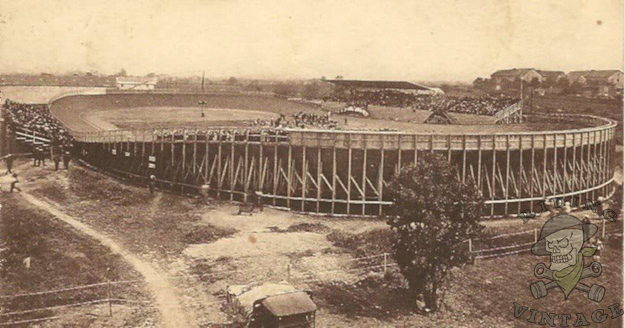 Even so, the amount of man hours needed to build a motordrome must have been enormous, especially considering the length. The average track was one mile long, but several were twice that distance. Rough cut 2" x 4" and 2" x 2" lumber was used to create the tracks' surface. It's staggering to think of the number of board feet needed to build a one mile track. 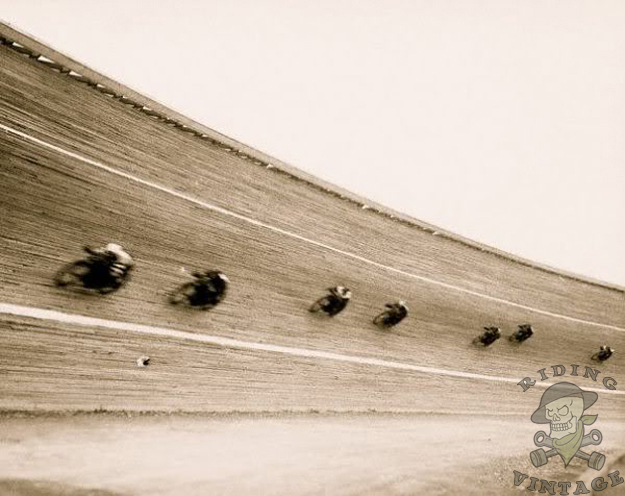 The corners were banked to allow the riders to maintain speeds around 100 mph, starting at 25 degrees on the inside of the turn and sometimes reaching a 60 degrees on the outside. The tracks needed constant maintenance, not only due to damage caused by wrecks, but also due to weathering. 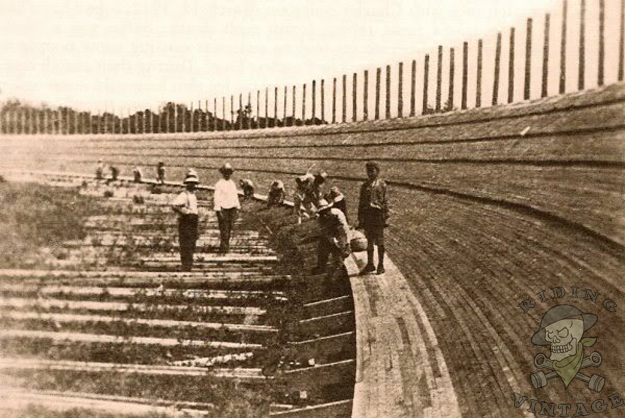 There were no suitable wood preservatives available at the time, so the entire track's surface needed to be replaced at least every five years. Due to this expense, most tracks were just torn down after a few years of use. There is no doubt that board track racing was an incredibly exciting event to witness. The motorcycles were capable of speeds over 100 mph and represented all the marques of the day. Manufacturers such as Harley-Davidson, Indian and Excelsior all had factory racing teams with custom built factory race bikes. Legendary racers such as Jim Davis, Otto Walker, Albert "Shrimp" Burns and many more made their names racing on the board tracks during the 1910's and 1920's. Nothing adds to the excitement of racing like danger, and board track racing had plenty to spare. Safety seemed to be of little concern to the riders, especially considering that the motorcycles were not even equipped with a braking system. The standard riders "uniform" consisted of a leather helmet, wool sweater, leather gaiters, pants, gloves and boots. Even if the rider walked away from the crash, he was likely to come away riddled with wood splinters. The spectators were also not immune from the dangers of the race track. 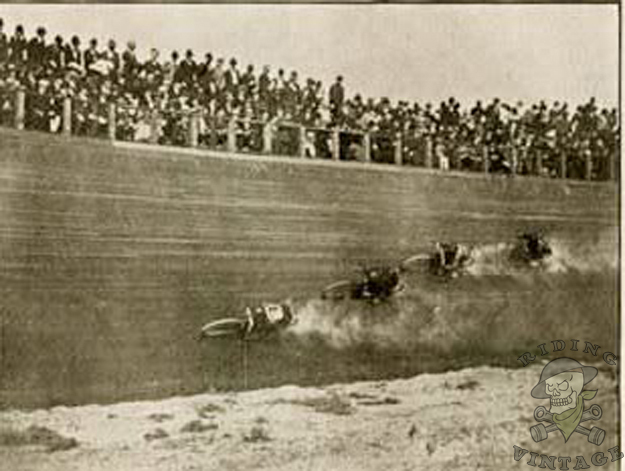 Since the viewing stands were usually built at the top of the track, it was not unheard of for a rider to crash directly into the crowd. The most infamous of these wrecks happened in 1912, when Eddie Hasha lost control of his motorcycle and crashed into the crowd, killing himself and four to six spectators. 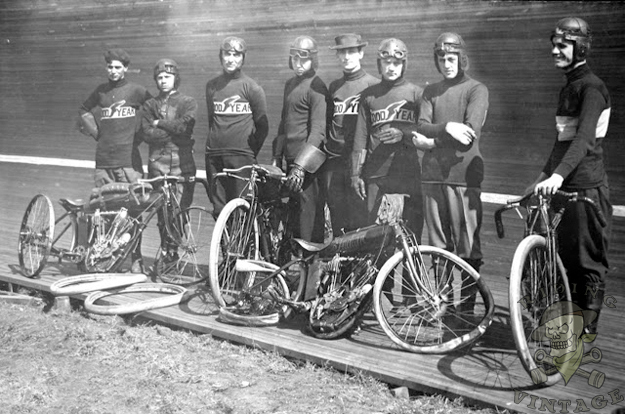 By the late 1920's, board track racing was rapidly approaching it's end. The Great Depression had an obvious financial impact on the races, but it was the number of deaths that was the greatest contributor to it's demise. 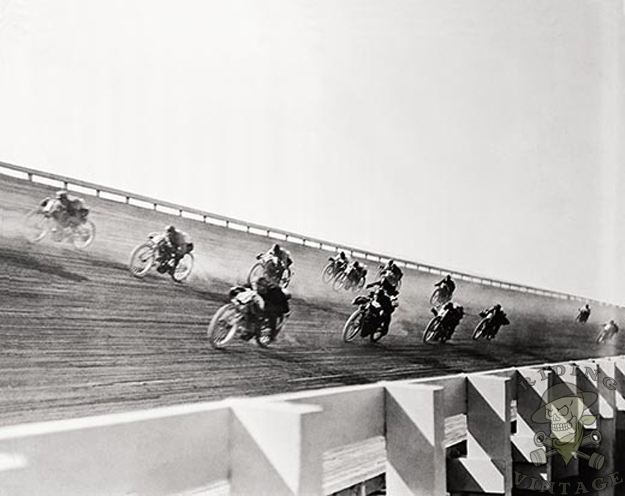 Several famous riders lost their lives, causing the press to nickname it the "Murderdrome". Albert “Shrimp” Burns died in a 1921 crash in Toledo, Ohio, Eddie Brinck was killed in a race in Springfield, Massachusetts in 1927 and Ray Weishaar was a 1924 casualty in a race in Los Angeles. 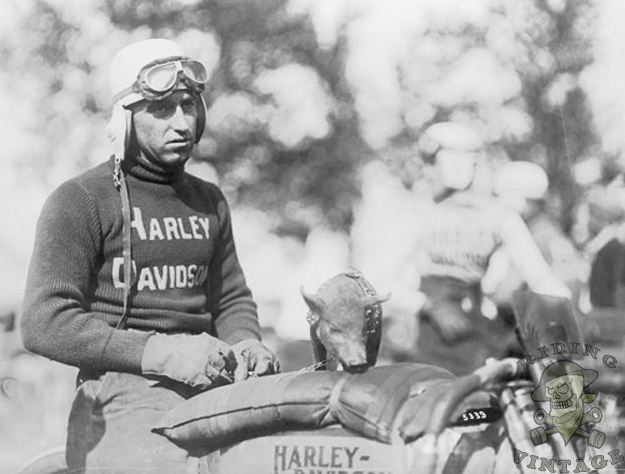 Weishaar was part of the Harley-Davidson racing team nicknamed the "Wrecking Crew" and was often photographed holding the team's mascot, a pig. It is believed this is where Harley's nickname "hog" originated.